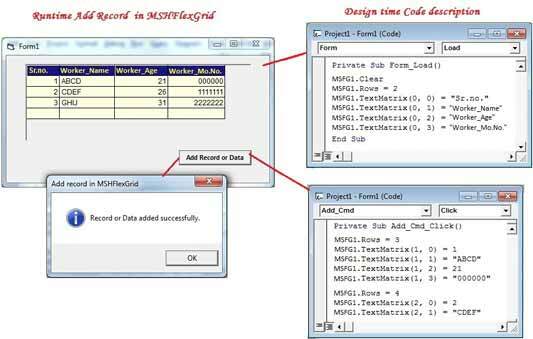 Adding column header in MSHFlexGrid and add items with its related column it’s an easy process, but one thing, you have to consider about that you cannot define more header name than number of Columns. First, find MSHFGrid component to Toolbox. After that go to Properties and set its column number. Suppose, we set columns and rows like bellow. Note: Fixed Rows is use for set number of Header. 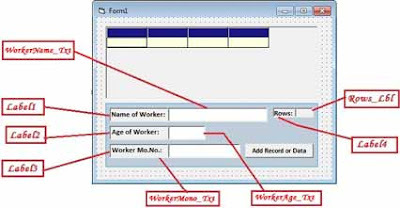 After apply rows and columns setting as mention in above image, write code in Form’s Load event. Suppose we set MSHFlexGrid Name as "MSFG1". For this process we will use code process. There is no facilities like Listview to add Header Name through Properties window. .Clear : Clear rows and columns. .Rows: Set row number for record insert. .TextMatrix(Row, Column): In TextMatrix, assign row number and column number in which you can set value or string. Note: In every record insertion, it is necessary to increase 'MSFG1.Rows'. Now, drag button to Form and set Caption as 'Add Record' and set Name as 'Add_Cmd'. After that, double click on this command button and type code on its click event as shown bellow. 'Like this you can add more items. Now, we will learn how to show Textbox data in MSHFlexGrid? Suppose, we design Textbox and Labels according to number of header. Now, write code on Form’s load event as shown bellow. This code will show header and row count at runtime. Now, write code on 'Add_Cmd' button’s click event as shown bellow. After typing this code, run form. Then input value in Worker_Name, Worker_Age and Worker_Mono Texbox and press on 'Add_Cmd' button. When you pressing on this button, a message box will appear saying 'Records or items saved successfully' as shown bellow. Now, This will show that, the data will add in FlexGrid control. ADODC connection and show database record in MSHFlexGrid. You can understand through given following output view. You can see the output of record process from Textbox to this component. If you are beginner and want to learn about this component in Visual Basic 6.0, then follow the steps just like I mentioned above. And as it is, I have coded it step by step. Learning process completed of add column header and data in MSHFlexgrid in vb6.0 at runtime (SKOTechLearn). How to edit or delete items from Listview in vb6.0.